CPD Seminar : Wireless LAN Auditing - "HOW-TO"
Wireless Local Area Network (WLAN) access points are now used extensively for private loacal area networks. Yet, signals from these access points are often not managed well and remain security risks. The Seminar focuses on a practical approach to performing a wirelss LAN audits in a manner that will not interfere with yours or other's networks. Furthermore, the methods of compliation and analysis of such audit results will be shared. By attending the seminar, you will be taught how to perform an audit, prepare report, and be able to discover any alternations from policy on WLAN access points. One CPE point can be earned by attending the seminar. The mobile devices, smart phones of today are more powerful than we ever could have imagined. The proliferation of these devices in corporate environments creates new and wider potential security risks and threats to the organizations through inadequate maintenance from their owners, or deliberately tampering of the operating system through intentional exploitation of the device’s vulnerabilities. 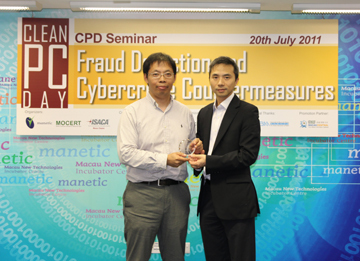 ISACA (Macao Chapter) is pleased to announce the CPD seminar – “Mobile Devices, Smart Phone, Jailbreak and Security”. This seminar investigates test cases to build up a background on where this situation is going and what are the compensating controls that can be placed in an organization for this risk vector. One CPE point can be earned by attending the seminar. The explosion of social networking has created new opportunities to develop friendships, romance and business communications. However, those social platforms also pose threats to the users and the organizations as the hackers using social engineering to gain access to your account and steal personal or business data for malicious activities. In view of this emerging threat, the ISACA Macao Chapter is organizing a CPD seminar on "Social Networking Security" to share how an organization may be able to leverage social networking facilities in a secure manner. This presentation will deal with the modern equivalents to social networking highlighting some areas of technical and strategic interest for security in an organization. With this knowledge, a staff, manager and director of an organization will be able to have a holistic view of the offerings that social networking provides, and how to secure it. CPD Seminar : Wireless LAN Auditing - "SET UP"
ISACA Macao Chapter is pleased to announce the CPD seminar - Wireless LAN Auditing - "SET - UP", a practical instruction allows you to apply the skills immediately for an audit by youself ! This is a practical that will show how to set up laptops for the purpose of performing a wirelss LAN audits in a manner that will not interfere with yours or other's networks. Data will then be shown how to be scrubbed of identifying information and then how to produce a map of the GPS location plots from the data collected. Reporting requirements are then addressed for a professional looking report. One valuable CPE point can be earned by attending the seminar. Co-orangized by SAFP, hosted by ISACA Macao Chapter, Macau Computer Emergency Response Team Coordination Centre (MOCERT) and Macau New Technologies Incubator Centre (Manetic), the event of "Clean PC Day" was held on 20th July 2011 at Manetic. 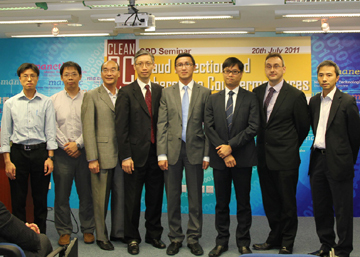 The event consisted of two separate activities running in parallel - The CPD seminar of "Fraud Detection and Cybercrime Countermeasures" and "Clean PC Activity". "Clean PC Day" was provided as part of the public awareness program to highlight the risks and countermeasures that all organizations and individual users need to deal when using internet connected computers for social networking or online transaction services, and to help computer users cultivate the good habit of cleaning up their PCs and minimizing the risk of cyber attacks. Guest speakers from Symantec, Valkyrie-X Security Research Group (VXRL), CSI World Headquarters and MOCERT shared their knowledge and experience with the audience. Mr. Terry Cheung, vice-president of ISACA Macao Chapter, presented the souvenir to Mr. Anthony Lai, founder and security researcher of VXRL. A group photo of guest speakers, organizers and co-organizer.